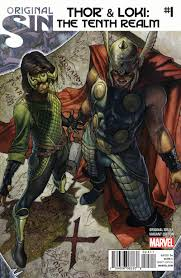 Original Sin #5.1 also know as Thor & Loki: The Tenth Realm #1 is finally here and with it we begin the tale of Angela's origin now that she is a Marvel character and not from Image. Earlier I've stated that I do no like the idea of Angela being tied to any of the existing Marvel characters. I still believe that by doing so diminishes her uniqueness as the closest thing that Marvel has to a true angelic character. By making her the daughter of Odin, at the least she is now a demi-god. There is a big difference between that and being an angel; all you've really done is add a new Asgardian deity of sorts to the Norse pantheon of the Marvel Universe. It leaves nothing special or unique about her. I also stated that I was willing to see how Jason Aaron and Al Ewing spun this story. I'm hoping that it goes well, I'm a huge fan of Jason Aaron and he's been doing an amazing job on Thor God of Thunder. However I do not read Loki Agent of Asgard, so I really have no idea what's going with both "kid" Loki and "future" Loki in this issue. Another thing that annoys me is the double artists. Both artists are fine, but having multiple artists in one issue, regardless of whom they are is a peeve that I have never gotten over. Simone Bianchi only did two pages while Lee Garbett did the rest. Why? Don't get me wrong, both are fine but having the two page spread by Bianchi is a tease and unfortunately I can't really tell what I'm looking at. The story starts with us looking a hut in a forest. There are only narration boxes telling us that this realm was forgotten by time, sealed off and forsaken and is the prison of gods. We then flashback to when the secrets held by the Watcher's eye were unleashed. We see a few of the heroes succumbing to these secrets. Thor sees a vision of war, a tenth realm, Odin, angels and of course he sees Angela. Thor then flies off with Luke Cage yelling for him to come back. Thor tells Luke that he must go, the structure of the cosmos is a lie and that he has a sister. On Asgard, Frejya, the All-Mother is hosting a group of elves asking for safe passage through Alfheim when Thor barges in demanding to speak with her of the these visions of war and the tenth realm. Frejya has her guests escorted out and then she and Thor have it. Thor explains to Frejya that he has seen all that Wather has seen and that he has seen his sister. Frejya is surprised by this and then tells Thor that he's mistaken, that he has no sister. Thor pleads with her again and Frejya loses it, telling Thor that he has no sister because she is dead. Thor begins an apology but Frejya now insists on telling Thor the truth. Freyja spins the tale of a war between Asgard and one that has yet been named, but a realm of angels. It will be interesting to see if Marvel give this realm a Norse like name or continue to call it Heven as seen when Angela was captured by the Guardians. Moving on, the war was apparently long and brutal and it was not looking good for Asgard. Both Odin and Frejya were on the front lines and the Odin-Force had been depleted leaving Odin weakened. A soldier approaches telling them that the angels have broken their defense and have taken one their children, their daughter Aldrif. The Queen of the Angels appears with the child in her arm telling Odin that he could end the war and save his daughter by surrendering. 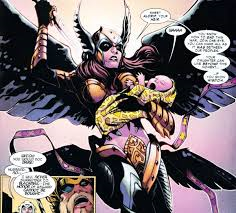 Of course Odin refuses and we are lead to believe that the angel queen kills the child. In his rage, Odin summons the full front of the Odin-Force, tearing the tenth realm from this universe and Yggdrasil itself, sealing it forever. Frejya again insists to Thor that the child is is dead. Thor tells her she is wrong, that she lives and that if she will not help him find her, he will go to somebody that will. We see the Future Loki talking to Frejya who believes the God of Mischief is responsible and is filling Thor's head with lies. Loki protests explaining that he has nothing to do with it, that it is destiny and it is only the first page leading to the future Asgard in which Thor is king. Kid Loki is sitting in a restaurant on Earth when Thor walks in asking for his help. Thor tells Loki of about their sister and the Tenth Realm. Loki realizes that he know where the lost realm should be and the brothers concoct a plan to find and enter the Tenth Realm. We next see Thor and Kid Loki riding through the the cosmos in Thor's chariot lead of course by Toothgnasher and Toothgrinder. Loki explains to Thor that they will need coordinate an attack on the barrier of where the lost realm is located. Loki finds an access point and Thor blasts it open with a the storm of all storms. This is where we get the two page spread by Simone Bianchi of Thor and Loki looking down at a courtyard or city of the lost realm, some of which has been torn asunder. We again go to Future Loki who in classic Loki fashion is monologuing while viewing an image of Angela, saying how everything is happening as he remembers it and I get the impression that Loki is scheming as always, that he is not going to let that the future of Asgard unfold like its supposed to. Overall not a bad issue but I didn't feel that there was anything overly revealing. The meat of this story is what happened to Aldrif/Angela when she was taken by the Queen of Angels. Maybe we will also get a glimpse into why Angela looked at Jean Grey the way she did during the Trial of Jean Grey. We will just have to wait and see what the story holds for us.